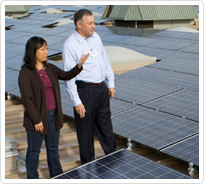 This webinar will help building officials and other permitting staff break through some of the barriers of residential solar installations by creating their own jurisdiction's expedited structural permitting procedures based on the California Solar Permitting Guidebook Structural Toolkit. The discussion will outline the code provisions, standards, assumptions and engineering reasoning that form the basis of the Structural Toolkit. The training also will address alternative procedures for regions with circumstances that fall outside of the basic guidelines, such as jurisdictions in special wind speed or snow load regions. Attendees will learn how to use the Structural Toolkit to determine whether a project qualifies for expedited permitting, as well as how to use the Structural Technical Appendix to address systems that fall outside the standard guidelines.